There is a reduction reaction of phenol with zinc dust which is found in many books. 1) What is the name of the reaction and who invented it? I have already done a google search, but it yields no results. My textbook also mentions nothing about the inventor of the reaction, or any name of the reaction. I understand that every reaction might not have a name, but at least it must have an inventor. You can't say that the reduction of phenol by distilling it with zinc dust is known from time immemorial. Can you? 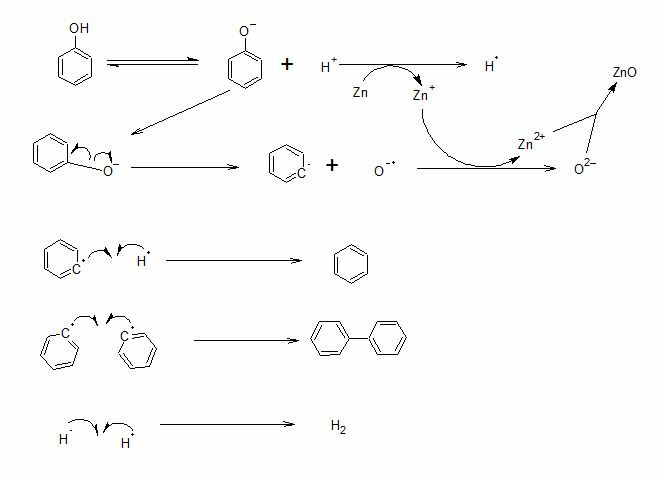 2)What is the reaction mechanism of the reaction? This and this page writes about a mechanism of the reaction. If drawn, I suppose it would look like this: It would certainly explain the formation of biphenyl and hydrogen ( if they are indeed formed). But the problem is that no reference is given in the answers. There is at least one book or paper which wrote about the mechanism. So, if you answer, please add a reference if possible. If you think that the above mechanism might be incorrect, then also add an answer. I want your insights on this problem. Browse other questions tagged organic-chemistry reaction-mechanism phenols organic-reduction or ask your own question. Can alkyl-substituted phenols be reduced to alkyl-substituted benzenes by zinc dust?